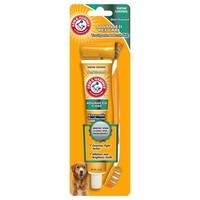 Arm & Hammer Toothpaste and Brush Set is the perfect way to introduce your pet to the benefits of good oral hygiene. The set comes with a dual headed toothbrush, a finger brush and a delicious beef flavoured toothpaste that leaves a fresh mint scent behind. Formulated with baking soda to deliver a thorough cleaning and to neutralize odours, the toothpaste also contains special enzymes that help to control and eliminate tartar. Not only will your dog have whiter and brighter teeth, they'll also have much fresher breath.